Marshmallow Buildings: You may remember this activity from your own childhood. Join your toothpicks together with marshmallows to build designs, towers and get creative! Pom Pom Letters: Draw a letter with some glue and have your child place pom poms on the glue until they have made the letter. Its a fun way to have them slow down and focus on one letter at a time. Water Play: Water play can be such a big hit! Get a large container, add water, some food coloring (optional), sterile bulbs, cups, bowls, whatever you can find around the house. Let them pour, squeeze and have fun. Rice Letter Writing: Place uncooked rice on a sheet of paper (I made mine multicolored for some added fun), write the letter you want your child to practice on a large piece of paper and have your child ‘trace’ the letter in the rice. Paper Weaving: Cut horizontal lines in a sheet of paper making sure to keep at least an inch on each side. Cut strips of paper and teach your child how to weave the paper going over and under the other paper. DIY ‘Chalkboard’: Cover a sheet of black paper with sidewalk chalk. Dip a q-tip into water and ‘draw’. Your picture will magically appear on your paper. Necklace Threading: Have your child thread beads and cut up straws onto a piece of string to make necklaces and bracelets. Always be careful of strangulation hazards whenever you are using long pieces of string. 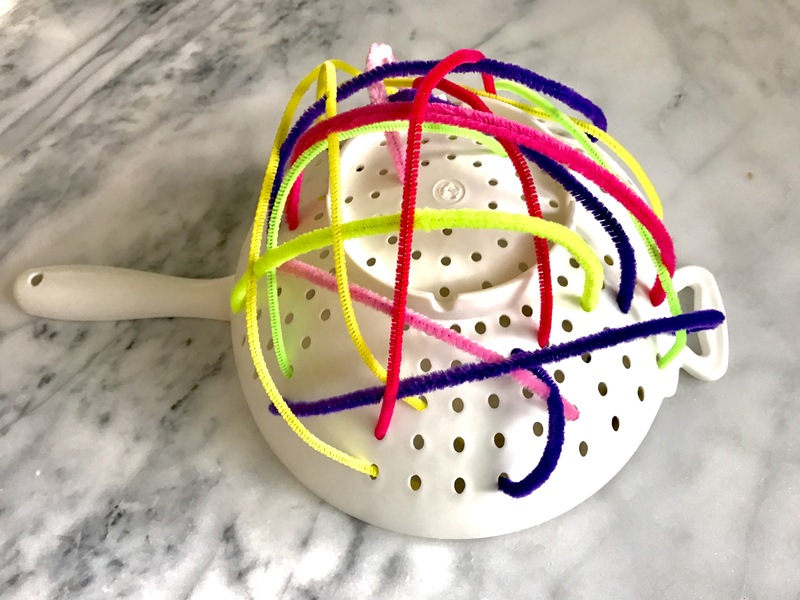 Pipe Cleaner Work: This is a great trick for keeping the littlest ones engaged while you are trying to get dinner ready. A few pipe cleaners and a strainer should entertain them long enough for you to quickly whip up a meal.